Today's Fabergé object - a lorgnette - was made by workmaster Henrik Wigström, sometime between 1908 and 1917! The lorgnette is made of two-colored gold, and has spring-hinged lens mounts. Part of the handle is enameled in cerulean blue over a guilloché ground, and decorated with husk leaves in gold. 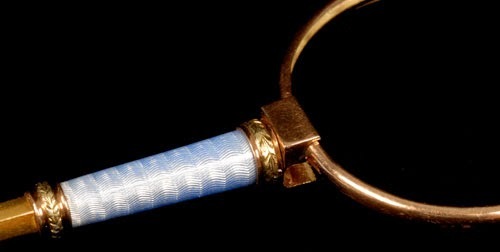 When closed, the length of the lorgnette is 5.5'' (14 cm), and the price for it is 18,500 USD. You find it at John Atzbach Antiques.